There are seven different order types by which to purchase or sell stocks in TC2000. This article will give a basic introduction to each one. A market order is the simplest order type. It tells TC2000 to buy, sell or close at the next "best price" currently available in the market. It is the order type used when getting filled (not price) is the primary concern. There are no price controls in a Market order (ie: no guaranteed specific execution price and the trade can execute significantly away from the current market price.) To place a market order, the only items necessary are (1) Quantity and (2) Duration (time-in-force). Note: Market orders are often used in protective stops. A Limit order is used when price (not getting filled) is the primary concern. It allows precise order entry by setting a price control. 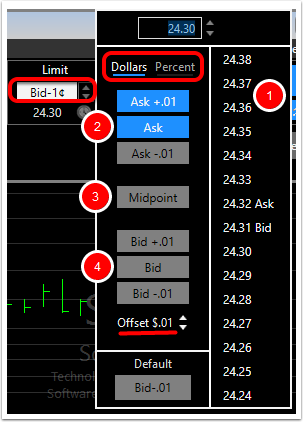 Example: A buy limit order can only be filled at the specified limit price or lower. 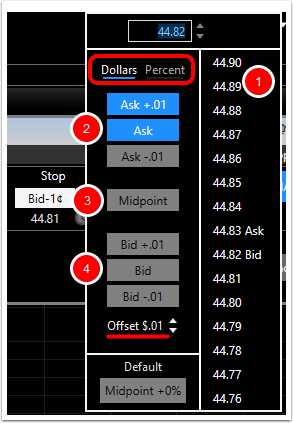 A sell limit order can only be filled at the specified limit price or higher. However, this control over the price paid for the stock removes any guarantee of the order being filled. With limit orders, other parameters besides quantity and duration must be defined. Either the limit price (an actual price value) or the limit basis (a price based on the bid/ask/midpoint or some variation of those) must be set. *These can be based on dollar or percent values. A Stop order tells TC2000 to place an order to buy or sell when the price of the stock reaches the stop level (ie: when a trade occurs in the market at or beyond the stop level). The order type placed with a Stop order is Market. All the characteristics of the Market order are then applicable (e.g. there are no price controls in a Market order; no guaranteed specific execution price and the trade can execute significantly away from the stop price.) A Buy Stop order releases a Market order to buy the security at the "best price" currently available in the market after the stop has been reached. A Sell Stop order releases a Market order to sell the security at the "best price" currently available in the market after the stop has been reached. With Stop orders the stop price level must be defined (an actual price value or a price based on the bid/ask/midpoint or some variation of those). A Stop Limit order tells TC2000 to place an order to buy or sell when the price of the stock reaches the stop level (ie: when a trade occurs in the market at or beyond the stop level). The order type placed with a Stop Limit order is Limit. All the characteristics of the Limit order are then applicable (e.g. price must be "better" than the Limit for the order to be filled. ) A buy stop limit order releases a Limit order to buy the security at or below the defined Limit price level after the stop has been reached. A sell stop limit order releases a Limit order to sell the security at or above the defined Limit price level after the stop has been reached. 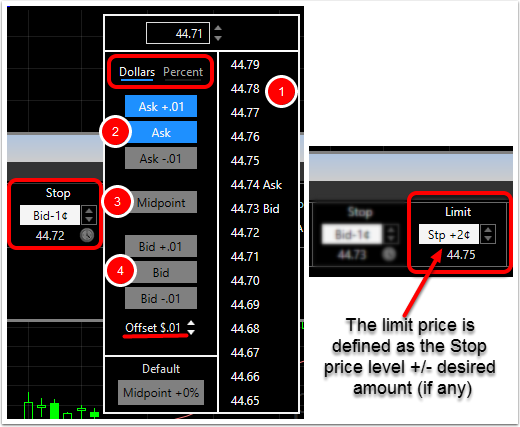 With stop limit orders both the stop and limit price levels must be defined. The stop and limit price levels do not have to be the same. A buy trailing stop order releases a Market order to buy the security at the "best price" currently available in the market after the stop has been reached. A sell trailing stop order releases a Market order to sell the security at the "best price" currently available in the market after the stop has been reached. With trailing stop limit orders the trail level (stop) must be defined. A percent offset from the price is used. A buy trailing stop limit order releases a Limit order to buy the security at or below the defined Limit price level after the stop has been reached. A sell trailing stop limit order releases a Limit order to sell the security at or below the defined Limit price level after the stop has been reached. 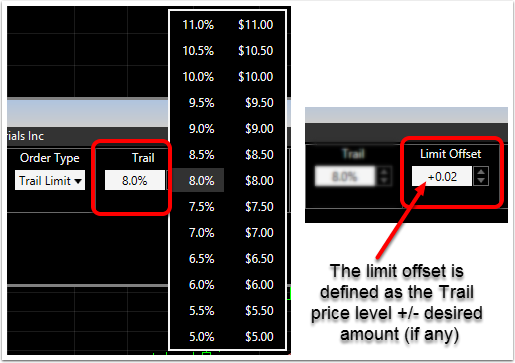 With trailing stop limit orders both the trail (stop) and limit offset price levels must be defined. 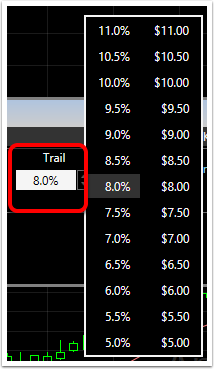 The trail and limit offset prices do not have to be the same. 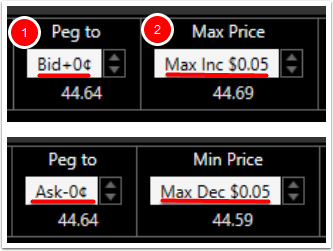 The Primary Peg order allows an order to follow the best bid (when selling) or the best ask (when buying) as a security moves within certain boundaries. The price levels for the peg orders are automatically adjusted as the markets moves (e.g. as the best bid moves up, so does the pegged order--by the offset defined and up to the maximum cap set). This order type is often used in volatile market conditions by more aggressive traders to increase the chances of their order being filled. In a Primary Peg order, the side to which the order is pegged (Bid or Ask) is shown. A peg to the bid side will show a Bid + and a Maximum Increase field. A peg to the ask side will show a Ask- and a Maximum Decrease field. OCA: (one-cancels-all) allows the order to be placed in an OCA group with any other active orders or existing OCA groups. OTA: (one-triggers-all) attaches stop, trailing stop , profit target or a bracket of any of these to the primary order.